If you’ve noticed sagging in your upper arms, you’re not alone. As we age, we all lose collagen and elastin in our tissues. Skin that was once nice and taut becomes vulnerable to the downward pull of gravity. Even women who target their triceps and biceps in the gym reach an age where they begin to notice sagging in the thin skin of the upper arms. The lack of arm definition can go from bad to worse when weight gain and/or weight loss are added into the equation. Weight gain can lead to droopy, flabby arms while weight loss can lead to deflated, crepey skin that hangs down from the arms. Wishing you could ditch the long sleeves and bare your arms with confidence? Four top plastic surgeons with combined decades of experience sculpting sagging arms provide insight to help you understand the treatments available. 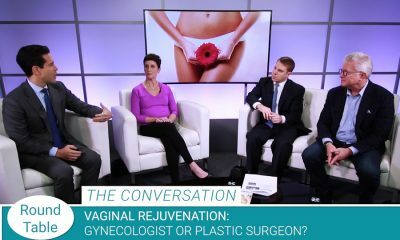 Liposuction alone is a great option to reshape arms, but only if the skin is firm to begin with, shares Seattle plastic surgeon Dr. Richard Baxter. Once the elasticity has declined, liposuction can leave arms looking deflated. “Brachioplasty with a scar is going to give the best overall result for most women,” says Baxter. Traditional brachioplasty, also known as an arm lift, is a sure-fire way to fix a sagging upper arm. Surgeons begin with liposuction, removing excess arm fat. Next, skin is removed along the length of the upper arm through an incision that extends from the elbow to the armpit. The scar that results – which fades with time – is the trade-off patients must decide to accept in order to achieve the greatest level of improvement. Not everyone is willing to accept a traditional brachioplasty scar. For patients who want another option, Weston, Florida’s Dr. Charlie Messa found what works for his patients is, “a liposuction procedure where you introduce heat in somewhat of a thermal injury to the subcutaneous fat.” While the tightening that results is minimal when compared with a traditional brachioplasty, it is enough of an improvement for some women, depending on the severity of the issue. Patients who have undergone massive weight loss are ideal candidates for brachioplasty, as it is the only procedure that will provide the degree of improvement they require. But, when it comes to a woman in her fifties with a little extra fat, it comes down to a judgment call based on the surgeon’s experience. “For me, I look at a patient, and I can tell if they need a bigger surgery,” says Boca Raton’s Dr. Jason Pozner. “There’s a continuum of care,” explains Chicago-based Dr. Laurie Casas. The person best equipped to determine where you fall along the sequence of aging arms and how best to set back the clock is a surgeon experienced with all of the treatments available along the continuum. It’s important to find a board certified plastic surgeon who will listen to your goals, assess your anatomy, and explain your options. Together you can determine which procedure will best meet your expectations.